The Egyptian goddess Mut, known as the Divine Mother, was the patron of the royal family and protector of mothers everywhere. Our modern society may have prejudices against vultures, but the Egyptians saw their maternal side in how tenderly they reared their chicks. 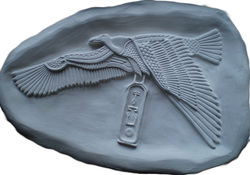 Mut is often depicted flying above the Pharaoh, her wings spread protectively above him, and usually holding either a cartouche of his name or the regalia of kingship. Displayed here in her winged magnificence, the goddess Ma'at embodies the concept of universal balance. Her name translates broadly to "The rightness of the world upon its creation", and it's her power that ensures day follows night and order triumphs over chaos. She is the scales upon which the soul's heart is weighed to grant entry into the afterlife. At the height of Egyptian splendour was Horemheb, General of the Army under Tutankhamun and raised to Pharaoh following his death. He is shown here wearing the traditional Blue Crown, known popularly as the 'War Crown' due to the frequency it is worn into battle, as well as the ceremonial leopard skin often seen with High Priests. This carving dates to approximately 1,300 BC and details the offering of incense and unguent to the gods. 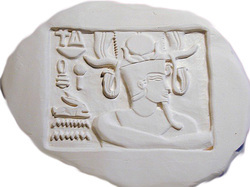 The associated hieroglyphs request that he be considered "like Ra" and be given life, power, stability and good health. Only just visible are the wingtips of the mother goddess Mut, who flies above the Pharaoh and offers her protection. One of the most notable Queens of Egypt's golden age was Nefertari, the Great Royal Wife of Ramesses II. So beloved was she that Ramesses had a temple of surpassing beauty built for her at Abu Simbel, and her tomb in the Valley of the Queens is the largest and most elaborately decorated. This image comes from that tomb, designated QV66, and is a 3D representation of a brightly coloured wall painting. It dates to approximately 1,250 BC and is a strongly representative of art and fashion at the height of Egypt's wealth. 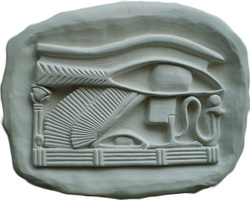 Among the most recognisable images to come out of Egypt is the Eye of Ra (alternatively called the Eye of Horus). It represents the omnipotence of the god as he casts his vision across the land, winging across miles with a single thought. It is shown here preceded by the sun-crested uraeus serpent, a protective device seen exclusively among gods and Pharaohs. To the south of the Valley of the Kings lies the Tombs of the Nobles, and it is within Theban Tomb 55 that Ramose leaves us elegant paintings and carvings of everyday life for a nobleman of Egypt's wealthy capitol. 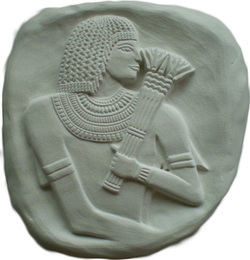 Here Ramose is bedecked with the most fashionable of wigs, necklaces and armbands while holding a posy of fragrant flowers to his nose. This image dates to 1,375 BC and is characteristic of the opulence and fashion seen within Egypt's golden age. This carving fragment dates to 1,470 BC and was originally attached to the mortuary temple at Deir el-Bahari, depicting Hatshepsut's father, Tuthmosis I. 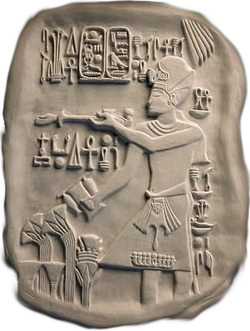 The Pharaoh is shown here wearing one of Egypt's most elaborate crowns, comprising of ram's horns, ostrich feathers, the sun disk and various protective uraeus-serpents. It is likely that Hatshepsut designed this image in memory of her late father, who was considered one of Egypt's finest rulers. 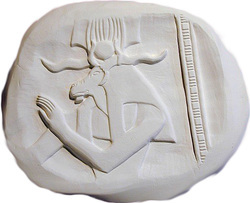 Ram-headed god Khnum was one of Egypt's oldest creator deities. 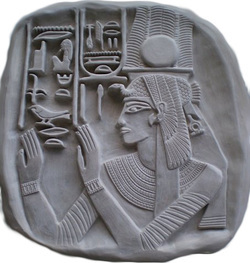 He is intrinsically associated with the clay that was washed down with the Nile's flood each year, and therefore the patron god of potters. Humankind was said to have been created by him on his potter's wheel and he was thought to have protected the source of the Nile.